Secret: knowing how to improve your butterfly stroke with a pool mirror is a lot easier than actually making the improvement. That’s because butterfly doesn’t just focus on technique, but also on building strong muscles. Still, knowledge is power, and the first step of getting better at your butterfly stroke is knowing where to start. Here’s 5 ways you can do that. Have you ever watched Michael Phelps practice his butterfly stroke? One of the first things you’ll notice is the way his body follows the lead of his head as it crests the water. That’s what you need to do when swimming butterfly. As you move, keep your shoulders and hips horizontal and focus on staying near the surface of the water. This helps create a smooth, consistent and streamlined motion for your butterfly. Breathing can make or break your timing in butterfly. Even with a good, clean start in the water, if you breathe too late it can throw your swim strokes out of sync. This wrecks your timing by preventing your chin from facing downward during your body roll. So, when you should breathe? Lift your chin out of the water when your arms begin to pull, while facing downward. To keep your momentum, take a quick breath then duck your head underwater as your arms rise out of the water. Doing this keeps your rhythm and gives you the time you need to start your body roll. In other words, you should be able to see yourself in your pool mirror as your arms break through the surface of the pool. Lots of swimmers practice their butterfly with mono-fins to get the hang of the dolphin kick. Whether or not you use swim gear to keep your legs in form, though, your goal is the same: to propel yourself forward with a fluid, simultaneous kick that presses your legs together like a dolphin’s tail. The strength of that kick will come from your hips. When you kick, don’t move “up and down” like a see-saw. Like we said before, you need to keep your body horizontal. The whole motion of your dolphin kick should “ripple” through your body like a wave. This gets easier with a strong abdominal core. Keeping your kick small and compact also makes the movement leaner and highly efficient! 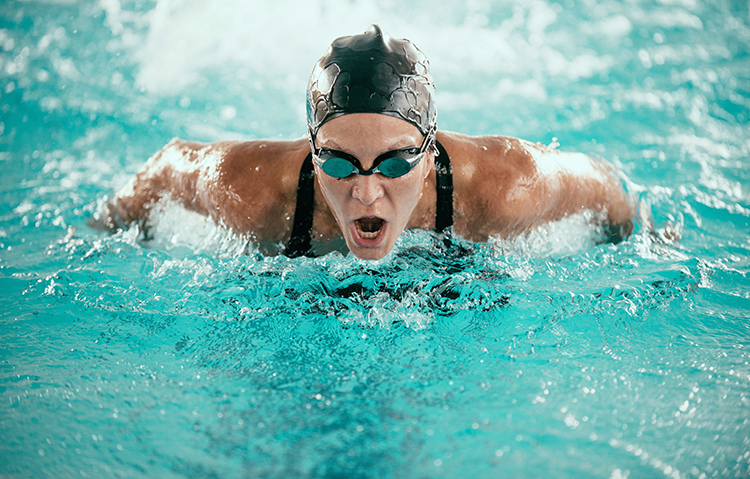 Remember what we said improving your butterfly stroke is as much about your physical abilities as it is about swim technique? Using both arms in butterfly means you don’t get a sideways rotation like you would in freestyle or backstroke, so it’s easy to get fatigued. In other words, you have to build your upper body strength to succeed. 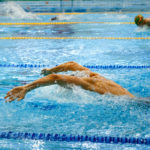 There’s a lot of butterfly drills out there that are designed to not only help perfect your swimming technique, but also to help build your endurance. Ask your coach or fellow swimmers about which ones they suggest, or look into the favorite drills of your butterfly heroes (everyone has their own favorite—even Michael Phelps!). Want to see your butterfly strokes improve in real-time? There’s a lot of benefits to using a pool mirror, but the best one by far is being able to assess your technique as you practice. Any swimmer benefits from seeing their strokes as they swim, whether they’re a beginner or an Olympic competitor. Fixing your most common swimming mistakes makes you faster and more efficient in the water, and less likely to continue with bad swimming habits in the future! Ready to improve your butterfly stroke with SwimMirror? With SwimMirror, you’re not only getting the ability to instantly assess your butterfly stroke, but you get a long-lasting product at one of the best values on the market.